Your new WordPress website installation needs some kind of web-hosting and a domain name (if you don’t have one already). What I did was to choose my hosting provider with care as you need to get the best WordPress hosting you can afford. You want it to be fast and reliable with adequate space and bandwidth resources and not to expensive :-). WordPress hosting is not for every web hosting service out there. WordPress requires high standards from the web hosting provider. I did some testing with a new account from GreenGeeks (aff) and although I was pretty skeptical at first, they really impressed me, and that is not so easy to do anymore. I have used several hosting companies and packages for my own sites and I have seen a fair share of others from customers websites. What was most impressive to me was not that they are 300% Green powered, Not the space offered and not the bandwidth and not even the free domain and unlimited MySql databases. What did impress me was the speed of their servers and most off all, and I don’t think they even know how great this is, the Softaculous WordPress Installation script! On all the other Hosting Providers on this page you can do a five minute or less WordPress installation with scripts like Fantastico. I stopped using those installations for a long time because they just did not gave me enough control over the installation and they create potential security holes. Softaculous does give you full control over EVERY aspect of your installation and you still can have it done in less then 5 minutes! I wrote a page on it for you to use. So if you get your hosting from GreenGeeks.com (aff) make sure you look in your Cpanel for the Scriptalicious WordPress Installation. The service of GreenGeeks is that good that I moved this website to their servers. This site is now hosted on Greengeeks.com (aff). I also used to have WordPress websites with other affordable hosting providers like HostGator, BlueHost and JustHost. Although I still have one site hosting with HostGator (aff) at the moment, I moved most of my main sites to Siteground (aff). HostGator started to use the same installation option (from the Mojo Marketplace) as JustHost (aff) and Bluehost (aff) use to manange installations and I just really don’t like it. It makes you go to another website to manage your WordPress installations and it is just confusing to work with. The fact that I got more control over my own installations is lost. 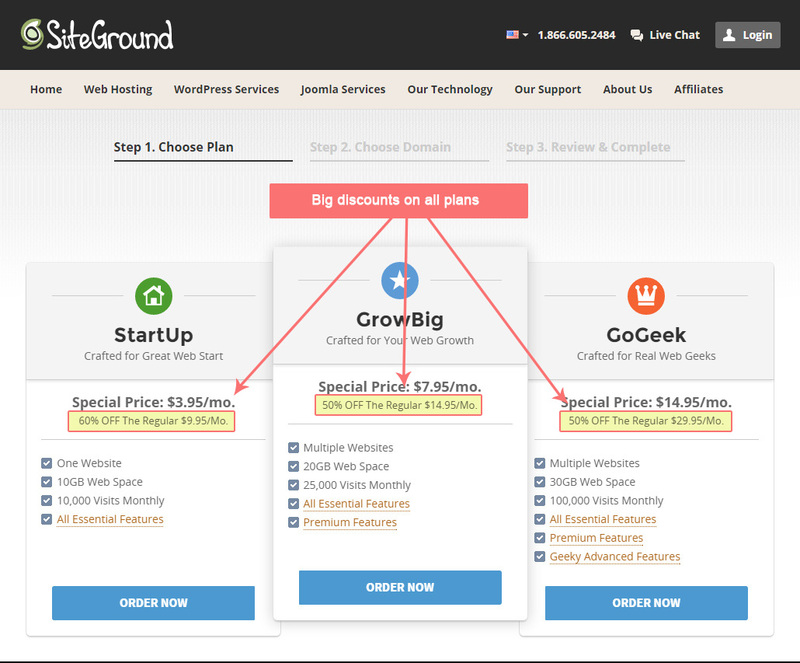 Siteground (aff) offers PHP 7, which boosts the performance of WordPress. They now also offer an easy and free way to change to https which helps with your Google rankings. It was an easy choice to go with Siteground now. They offer good value for money and a hosting package I liked for my hummerbie.com and wpmanuals.com websites. Since I have multiple websites that I wanted to move I choose the GrowBig package. After that the whole process of moving to Siteground was pretty easy to do. If you want to they can do the move for you. I did it myself and the fact that I use Namecheap.com for my domains it was just a matter of changing DNS servers over to Siteground when the mover was done. Like I mentioned before, Sitegound offers PHP 7 hosting, it give you the option to implement https://letsencrypt.org/ in a very easy way. But they also scan my site for Malware and viruses and they keep an eye on WordPress for you. They identify and patch WordPress version updates and vulnerabilities to make sure you have a safe installation. They will send you a warning upfront before they do their patching and updates so you are aware of what is going on. I normally don’t use a hosting providers support option as I can fix most of my problems with WordPress myself. In this case I did need the Siteground support to get an error fixed with a ssl certificate on one of the hosted sites. So I prepared myself for a long wait for a chat session or having to go back and forth with email tickets to explain the problem and get it resolved. After all that is what I got just to over the years with other hosting providers. The difference with Siteground support was Hugh… I send one ticket writing down my problem and I got a reply back withing a couple of hours stating my problem was fixed! After checking it really was fixed and the fix was implemented within 30 minutes after I send the ticket! The time to get the mail into my mailbox from support was due to my mail settings, I don’t like getting new mails ever 15 minutes, otherwise I would have know sooner. * Always read the fine print (Term of Service) before you decide which one is right for you! Why did I choose different WordPress hosting providers? They all offer pretty much the same options for about the same amount of money! The main reason for me to have different hosting provides is that I like to spread my risks, if one providers goes down for any reason at all, I still have other websites running. And if there is a mayor problem with one of them I can move my domains to another provider without big problems as I already know how they work. One last note, the links in this article and across the site are affiliate links, which means that I get financial compensation if you order via those links (but you already knew that, didn’t you :-)). Those compensations will help me pay for my hosting but will not cost you extra! I use these WordPress hosting packages myself and I am really satisfied with them otherwise I wouldn’t promote them. I still have other packages with different providers but you won’t find their links on this site because their cpanel is too complicated or I am not satisfied by their performance. The sites that are currently hosted on those packages will move to either GreenGeeks or Siteground. I already have moved several sites away from JustHost.com, Bluehost.com and HostGator.com once those contracts expired. Not that they are bad hosting companies, but just because they did not fit my expectations any more. Which had mostly to do with the current Mojo Marketplace integration on all three of them. The hosting they provide for a WordPress website might fit you better than me, so do check them out before you decide. Disclosure: This website is independently owned and operated. WP Sitebuilding is a professional website which might receive compensation from the companies whose products and/or services I review. I tested and reviewed the web hosting sites posted here and the opinions expressed here are my own.